“’Twas the night before Christmas . . .” and Texas is ready and waiting for old Santy to appear. You may know the story, but you’ve never heard it like this before. Based on Clement C. Moore’s poem, Texas Night Before Christmas is filled with images of the Lone Star State, whimsical illustrations, and playful text. Author/illustrator James Rice (1934-2004) produced sixty books, including the illustrations for Pelican’s treasured The Night Before Christmas Series. 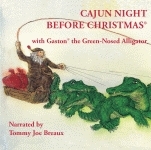 Mr. Rice’s first book, the well-loved classic Cajun Night Before Christmas, has more than 750,000 copies in print. 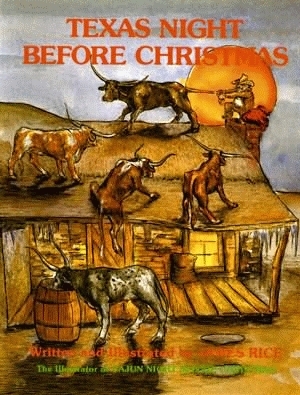 Young readers also enjoy Cowboy Night Before Christmas, Redneck Night Before Christmas, and Texas Jack at the Alamo. With almost two million copies of his books in print, Mr. Rice ranks among the nation’s best-selling creators of children’s books, receiving awards from Printer Industries of America and the Children’s Book Council. Color and b/w illus. 10th ptg.